Thank you so much! I'll be sure to follow back! Thanks! I'll make sure to follow you as well! Thank you! I'll check your blog out! please follow me via GFC and facebook. that would be so nice. Thank you very much! I'll be sure to do so! Nice outfit!! I am following you and I hope that you' ll follom me back! Thanks! I'll follow you back straight away! Hey cutie, thanks for visiting my blog and following me! gorgeous outfit! thanks for stopping by my blog. yes I'd love to follow eachother, thanks for asking! Thanks a lot! I followed you on fb, you have an amazing blog! 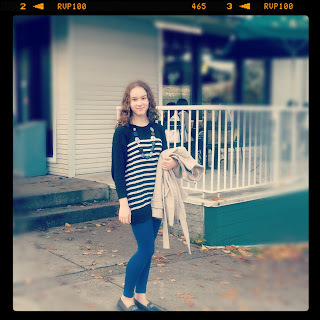 Fun ootd post! I also try to post an ootd....it's a lot of work! Looking good. I think that dress is so cute! You're adorable. Thank you! I would love to! Now following on GFC! Thank you for following me, I followed you back! love this blog... i follow you... do u follow my italian blog? Thank you, I followed you! Thanks for following me, I followed you back! Hey. You have a nice blog. I wanted to ask if you like to follow my blog &’ll follow yours. My blog will talk about beautytests. Such a lovely outfit and blog. I am following you now. I hope you will check out my blog. Thanks! I followed you as well! I love the outfit!! Really amazing! Hi thanks for the comment, I'm following you on bloglovin' waiting for you! Oh sorry! I was thinking that you have bloglovin'! yes we would love to, we follow you now! Cute, cute! Black and white is the most perfect mixing and matching colors to play with on an outfit. Can't wait to see the end of your month. Cute outfit! I'm your newest follower :) I would love for you to follow my blog too! I think something went wrong when you followed me, but I'll be happy to follow you back when you do!